Big Changes for Social Services? Coming up on 24-25 March- Neighbours Day Aotearoa is about all of us going one step further in getting to know our neighbours on one day (weekend) of the year. The idea is great neighbours make great neighbourhoods, so we turn streets into neighbourhoods, strangers into people we know, and our streets get to be more friendly, safe and resilient place to live. To live in a neighbourhood, it helps to have a house. Looks like it is made more complicated by the gap between social housing demand and social housing fund availability which has been oversubscribed four and half times. There is $37.5 million available, but the new social housing unit has received 94 applications for around 171 million. The Social Housing Unit is not filling the gap left by Housing New Zealand’s progressive service withdrawal. Housing New Zealand agrees it could have done more for a familyliving in a garage in Hamilton. The family was living at their Auntie’s Housing NZ home, and instead of getting help, their Aunty was served with a breach notice. Housing New Zealand later apologised and is assessing the family’s needs. A common problem is much of our social housing is getting old and needs costly repair. Porirua City Council is currently facing this problem with 26 flats. The upgrade costs are too high for the council, so they are asking the Porirua public for their views about being a social housing provider. However they are also concerned about the needs of the residents for whom the houses are home. Counsellors in Christchurch report a huge increase in numbers of people seeking free counselling. It’s largely the double whammy effect. First there are the earthquakes and dealing with immediate needs. Then there are the delays in decisions which can increase stress and frustration. The result: anger and irritable relationships, on-going powerlessness, and increased risk of depression. Other beneficiaries are being paid to clean up storm damage in Taranaki under the Enhanced Taskforce Green scheme. The workers partner with local councils, iwi and community groups. The scheme includes wages for workers, wages for supervisors, and safety gear and equipment hire. Neighbours’ Day suggestion #13½: find small jobs for young neighbours needing pocket money. More than 2,500 public sector jobs have gone since 2008. Treasury had suggested Government should look at $250 million in savings per year. Spending in the last year was cut by $20 million, and Treasury itself made $338,000 in savings. Meantime, Wellington’s unemployment rate has jumped from 5.4% to 6.4% in a year. Bill English is expecting further savings in “back office” costs, and points to the Second Annual Administrative and Support Services Benchmarking report which can be used to help make changes. Most controversial seem to be work requirements for those on the DPB with young children. Paula Bennett is pleased people on benefits decreased by over 21,000 in February. People on the DPB increased slightly to 99,643 due to growth in those caring for the sick and infirm. But, the new part time work expectation for people on DPB with children six years and older meant an extra 2,300 working part time. Prior to the new Future Focus policy, there was no work expectation until children turned 18. Labour has appointed a spokesperson for children (Jacinda Ardern), and their early childhood education spokesperson is concerned about parents finding good childcare when they have to go to work. “Mothers need to be able to make the best decisions on behalf of their children, whether they are the sole parent or in two parent households,” says Sue Moroney. Policy Analyst at Women’s Health Action, Christy Parker cites international evidence showing “women’s decisions regarding children are much more likely to be based on their personal and relationship circumstances than on government policy.” “ … Women who can’t, or don’t, control their fertility whilst receiving welfare support, end up subject to disproportionate levels of poverty and hardship resulting from welfare sanctions such as these (work-testing after the child is one year). This results in poorer health and greater social and economic marginalisation for both them and their children." If this wasn’t enough, the tax system could be another problem for work tested beneficiaries. 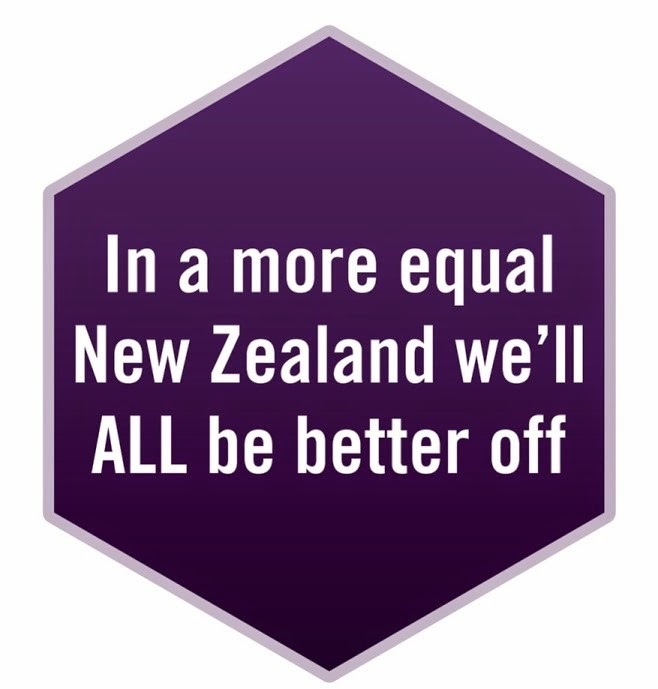 John Key argues 20 hours of work pays because a sole parent gets a top-up of $199.50 per week from the Minimum Family Tax Credit, as well as $60 for the In-Work Tax Credit, resulting in an annual net $13,500 for extra tax credits, plus extra childcare subsidies. But, the “Minimum Family Tax Credit has a 100% effective marginal tax rate, … which means for every additional dollar of net income earned up to $22,204 per year, the Minimum Family Tax Credit disappears dollar for dollar. At the minimum wage, someone who was working 20 hours would have to work an additional 17 hours before being any better off at all.” Our beneficiary better have obtained a regular job, because if she has a casual one, she faces ongoing problems of reporting in to IRD on a weekly basis, as well as extremely uncertain income. Of course if she needs childcare for the IRD visit then …. Neighbours’Day suggestion # 567-407-893: Helping neighbours with complicated forms. Gambling Helpline and Kidsline, have agreed to work more closely together to provide a consistent approach towards helping families and individuals affected by problem gambling. It’s probably just as well, as the Child Poverty Action Group note Auckland Council is considering allowing Sky City to increase the number of their electronic gaming machines (pokies) from around 1,600 to over 2,100. Christchurch City Council is maintaining their sinking lid policy with machines in earthquake-affected areas gone for good. The Salvation Army in The Growing Divide, 2012, report that there has been an 18% decrease in spending on the pokies over the last 5 years prbobaly because of 13% fewer machines in New Zealand’s neighbourhoods. And we are all part of the wider neighbourhood. Does our neighbourhood want councils to solely focus on essential local services such as waste, water, roads, libraries and consents, as Local Government Minster Nick Smith is proposing? Will this mean no more neighbourhood concerts in the park etc? Will children’s interests get a look-in in urban planning? Will we be able to turn to a functional and effective Family Court when the going gets rough. And should iconic cathedrals be in public ownership? And what about being a neighbour when we either don’t want to, don’t understand, are fearful, or just don’t want to know. Our race relations commissioner tells us Māori and Pasifika continue to miss out, and Asian peoples encounter discrimination and harassment. He has 10 good ideas for improving race relations. Stressed Out posters from Skylight - A4 size posters with simple graphical suggestions for handling stress. Public Health Association 2012 conference: Equity from the start – valuing our children, to be held 3-5 September in Wellington. Find out more at http://conference.pha.org.nz. Spare a thought for: Pupils and staff at South New Brighton School who are still using portaloos more than a year after the sewerage system was destroyed. Raw sewage came up on the school grounds recently. The school's sewerage system will be completely replaced.